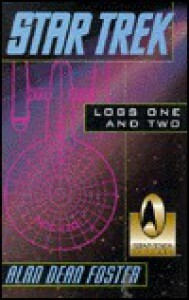 Refer to my review of Logs 9-10 here: http://www.goodreads.com/book/show/2449616.Star_Trek_Logs_Nine_and_Ten for why I have not become a fan of the Log series. In Logs 1-2, my primary interest was in reading "Yesteryear." Recently I availed myself of the animated series' DVDs via Netflix. It was not a nostalgic return to my youth. Most of the episodes were pretty lame and the animation was atrocious (even by mid-'70s standards). On the other hand, Foster has often been a good novelizer (is that a word?) of movies, and I hoped he could work his charms on these stories. I couldn't do much more than skim through the remaining stories. The flaws I elaborate upon in my review of Logs 9-10 are evident here as well. Logs 1-2 gets 2 stars because of the presence of "Yesteryear" but, otherwise, I'd recommend skipping the rest.